First lunch off the plane from America at the Auerwirt Beergarden above Berchtesgaden, Germany. 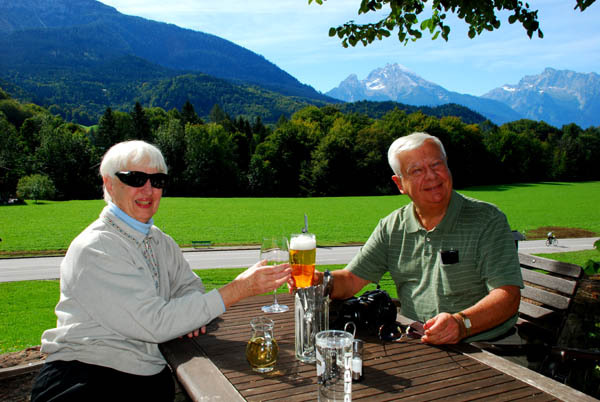 Art and Carol have taken five trips with European Focus since 2008 including trips in Germany, Italy, Ireland, France, Spain and for this most recent adventure, which started in Berchtesgaden, Germany we traveled through parts of the old Austro-Hungarian Empire. More to come, and welcome back Art and Carol! Posted in Germany Tours and tagged auerwirt, berchtesgaden, europe, germany, private, tours, trips.